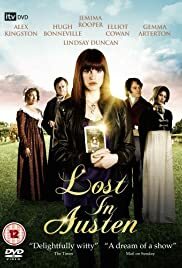 How many episodes of Lost in Austen have you seen? Mr. Darcy: [surprised] Miss Price. Amanda Price: Yes. We should celebrate. You asked me a question and I answered it. And we didn't have an argument about it. 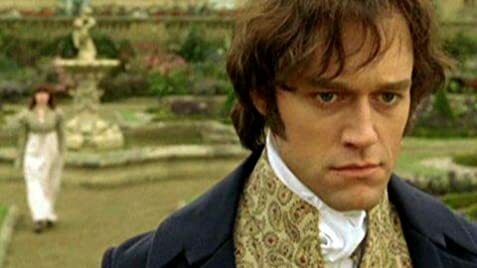 Mr. Darcy: I did not ask you a question. I made an observation, 'Miss Price'. The confirmation of your identity was entirely superfluous. As a result we are now arguing about it. And therefore, you are wrong. Amanda Price: That's so sweet. You're actually trying to make me laugh. Mr. Darcy: Yes. It shall not occur again. Amanda Price: And you're smiling. Mr. Darcy: No, no. 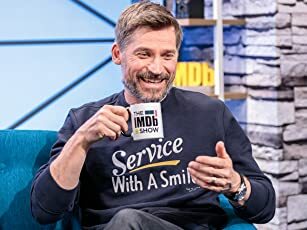 I only smile in private... when nobody is looking. Hard to imagine how this could be better. The casting is close to perfect. Mr and Mrs Bennet as played by Hugh Bonneville and Alex Kingston quickly outshine previous inhabitants of these roles. This Mrs Bennet is neurotic but also strong, and Mr Bennet is suitably acidic but also very affable and easy to like. The Bennet sisters are very well presented. Jane has a very gentle quality. Kitty and Lydia and Mary are a pleasure to see on screen. Gemma Arterton is as impressive as we would expect in the role of Lizzie. Best of all is Jemima Rooper as Amanda, a fine young actress who here gets the chance to take centre stage and to properly show us what she can do. The men inhabit their parts well - some very good work from Tom Riley as Wickhan, Eliot Cowan as a smouldering Mr Darcy and Tom Mison as a very winning Mr Bingley. Christina Cole is on great icy form as Mr Bingley's sister. And Mr Collins is truly repulsive as played by Guy Henry, looking like the grim reaper and finding a grotesque comedy in this very oily character. But what is most clever about this new 'spin' on Pride and Prejudice is the way it takes a story we all think we know and then turns it upside down. Guy Andrews writes very funny dialogue for both Amanda as a modern woman and the characters we know from Jane Austen. The comic set pieces are directed with real aplomb by Dan Zeff, but it's also surprisingly moving at times. Costumes and sets all look good. Having seen this I don't know how we'll take another 'straight' Austen adaptation seriously again! 58 of 67 people found this review helpful. Was this review helpful to you?